The following post is originally posted in the DIWUG E-Magazine. Click here to download. 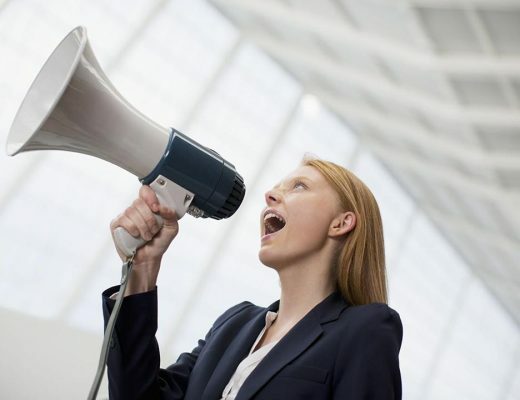 For many years, SharePoint was always the center of attention. Ever since its release in 2007, the growth and popularity was spectacular. SharePoint had its own yearly event, free community driven Saturday events, local user groups and more conferences popping up every year, worldwide. Although these facts speak for themselves, there was something wrong. The brand name seemed to get less attention and love from Microsoft per year. I blame Office 365. Don’t get me wrong, I love Office 365, but SharePoint became only a small part of a bigger picture. Figure 2: SharePoint is back! Most definitely not! Welcome back old friend. We can all see that it’s an exciting time for the SharePoint platform. 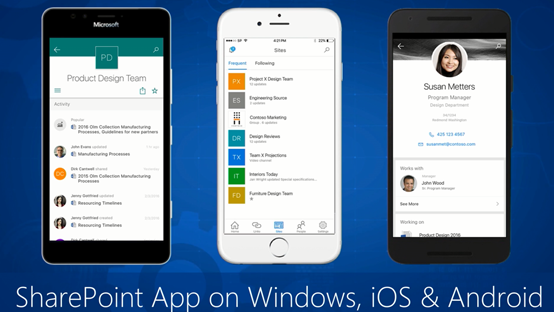 It’s great to see new services (PowerApps & Flow & Groups) coming together with SharePoint. My favorite development is the focus on basic features such as file creation and sharing, the launch of a native SharePoint App. And last but not least, the integration of team sites with Groups. The announcements during the Future of SharePoint proved to me that Microsoft is going back to basics with SharePoint and really focussing on the strengths of the platform: collaboration between teams & individuals. In my eyes, there hasn’t been much happening in the SharePoint space over the last couple of years. Microsoft had a huge focus on Office 365 and pushing it towards new and existing customers. Yes, SharePoint Online received new features, but nothing major. SharePoint 2013 contained nothing new compared to its online bigger brother. You have seen new services appearing, clearly inspired by SharePoint, such as Delve, Groups and the Video Portal. I totally understood this move because Microsoft wants to keep up with the competition and make Office 365 the platform for innovation and productivity. SharePoint always lagged behind. For example, transferring documents between sites, or Groups and OneDrive, has been a very painful process. Microsoft is now dedicated to really solving these types of issues and making the platform more powerful than before. You start working in OneDrive on your presentation for the upcoming team meeting. The presentation is aimed at a review of the Future of SharePoint. Wait a minute! Your colleague Dave also watched the event and you want his input. You share the file with one click and work together on the presentation. Now it’s time to share the presentation with your team. You have been working with Groups for a while now. Do you have to download and upload the document in the Group? No, with a couple clicks you easily move the file to the Group. You aren’t using a Group? No problem, just move the file to your team site. Sounds like a basic feature right? Let’s not forget this was an absolute pain in the behind for many, many years. Microsoft is dedicated to make your and your business users lives easier. We are all part of the mobile device revolution. We have an iPhone (believe me, you should get one), Android or perhaps a Windows Phone (believe me, you shouldn’t get one). I am almost certain you have a tablet as well. This isn’t only the case for techies but for most business users it’s a reality. We all want to use our mobile device to visit our corporate Intranet portal and work with our, and colleagues, content. What’s the to-go platform? SharePoint of course. No more need for expensive 3rd party mobile Apps. 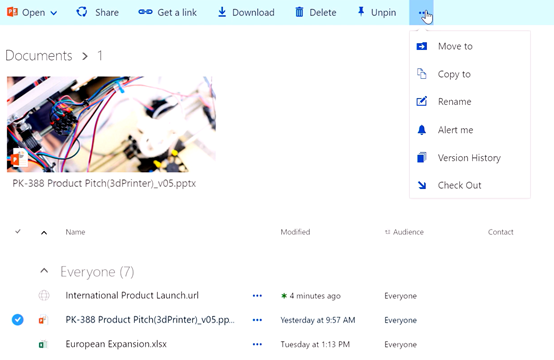 The SharePoint App, created by Microsoft, is finally here. The App is going to be a game changer. The App is free, fast, integrated with the Office Graph and really focused on the new improvements for sites, libraries and lists. I have talked to the product team and they are working extremely hard to release a great App for SharePoint users all over the world. By using Jeff Tepers words: “Your Intranet in your pocket”. The majority of the projects I work on, are aimed at SharePoint Online. Over the last few years, we have seen a huge interest and increase in customers moving towards Office 365. That being said, there are still customers, for example law firms, who aren’t ready yet for the Cloud revolution. They want to keep using SharePoint on-premises. This is mainly due to concerns about security from the business and IT departments wanting to keep control over their hardware & software. Of course, I don’t entirely agree with this point of view but that’s the reality and world we live in. These companies, of course, have every right to an innovating, business empowering and reliable SharePoint platform. That’s where SharePoint 2016 steps in. Microsoft built SharePoint Server 2016 from the Cloud up with all of the experiences and lessons learned from hosting SharePoint itself. The latest on-premises release is more powerful than before. Microsoft really shows its commitment by release feature packs, from 2017 onwards, to provide its customers with new features and innovations from SharePoint Online. This announcement is unbelievably exciting news and important. You can clearly see that Microsoft is creating a bridge between SharePoint Online and on-premises and living up to the hybrid promise. Funnily enough, my last article for the DIWUG e-magazine was about Groups. I discussed my five favorite features and hoped to inspire people looking into Groups. The evolution of Groups has been growing steadily since its release. One of the major pain points was the lack of integration with team sites. This caused a lot of confusion in the SharePoint & Office 365 community but mostly with our customers. What are you supposed to use and when? Microsoft did announce an integration at the Australian Ignite Conference last year but then it stayed quiet for a while. The missing piece, from a functional and business perspective, has always been connecting the two with each other. By realizing this connection, Microsoft will create a collaboration “tour de force” that is going to be unstoppable. The time is finally here! Are you creating a team site? You automatically receive a Group. Are you creating a Group? You automatically receive a Team Site. You are now able to leverage the power of team sites and Groups. The quick launch of a team site is extendible with quick links to, for example, conversations or Planner. Life has become a lot easier, believe me. SharePoint is back, stronger than ever and here to stay. I haven’t seen such commitment since the announcement of the “Cloud first” strategy during the 2012 SharePoint Conference. Is there any critique though? Yes, I am Dutch for a reason. My major concern is branding. The majority of our customers have a custom branding in their SharePoint Portals. How is this going to work with the new team site, document library and list experience and look & feel? The new responsive pages are incredible, but what about page lay-outs and pushing corporate fonts? I haven’t heard any statements or information about these concerns. This is something that has to be addressed in the near future. I am definitely not going to close this article with critique but with overall praise. The roadmap, vision, innovation areas and overall proudness by Microsoft promises a very bright future for SharePoint. Online and on-premises.